William Whitford (bioprocess cell culture strategic solutions leader for GE Healthcare), a member of BPI’s Editorial Advisory Board. The International Society of Pharmaceutical Engineers (ISPE) recently announced its 2018 Facility of the Year (FoYA) awards. 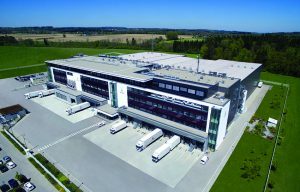 Vetter Pharma-Fertigung GmbH & Co. KG is the “facility-of-the-future” winner for a project to optimize pharmaceutical processes at its Center for Visual Inspection and Logistics in Ravensburg, Germany (17). This contract development and manufacturing organization (CDMO) offers supply chain processes to large and small customers within a single facility for clinical and commercial filling. The FoYA judges panel was impressed by an intelligent combination of location, design, state-of-the-art technologies, and innovative processes at the Ravensburg site. This new center offers an outstanding degree of efficiency, flexibility, quality, and security in the injectables supply chain. Clients gain efficiency, flexibility, safety, and sustainability with optimized spatial planning, state-of-the-art technologies, and enhanced work stations. The facility was designed to be highly sustainable, environmentally friendly, and efficient. Vetter uses an ISO-certified environment, health, and safety (EHS) program — one feature of which is the building’s use of renewable energies such as making extensive use of recycled waste heat (17). BPI: What industry trends feed into the need for flexibility? We think of single-use technology and modular facilities as means to that end, but what are some other aspects? Whitford: One trend feeding that need for “flexibility” from modular and single-use facilities involves a desire to produce more than one type of molecular entity within the same facility or suite. That capability could support unplanned changes in the products being supported, such as from approval failure or postapproval market forces, scheduled changeover to a different product within a sponsor’s multiproduct portfolio, or contractually scheduled change to a new entity (or tenant) by a contract manufacturing organization (CMO). Another driver is the desire to support more than one mode of production. Examples include fed-batch and perfusion culture upstream or batch capture and multicolumn periodic countercurrent chromatography downstream. The concept of plant flexibility also can apply to production scale. For example, a suite containing a 10,000-L bioreactor cannot be used for product development. However, a flexible suite designed to allow bioreactor reconfiguration can support both product development and technology transfer activities in addition to control of production scale through increasing or decreasing the number of bioreactors with limited capacity. Kakad: Another industry trend that we are seeing is the need for robust single-use technologies that can withstand storage at ultralow temperatures (down to –80 °C). To address this need, my company has developed a portfolio of novel materials that remain robust at those storage conditions. Battist: Single-use technology eliminates the need for heat sterilization, steaming in place (SIP), cleaning in place (CIP), and associated validations, thus reducing both the utility requirements and complexity of a biomanufacturing facility. It also significantly decreases the risk of cross-contamination and the burden of cleaning validation that is inherent to processes with shared equipment. Suppliers are developing better product-contact materials and partnering with the biopharmaceutical industry through the BioPhorum Operations Group (BPOG) to set standards for qualification of single-use components. In addition, they are pushing the boundaries for what is possible in mixing and in the transfer of oxygen and heat in a single-use bioreactor. Maximum scale also is increasing for other single-use equipment. Experience tells us that being able to use such systems with aseptic connectors or tube welders is a major advantage. Feeds can be added without interruption, and samples can be taken at the right times. Another example is product recovery from clarification filters. I may want to perform a postuse flush to recover as much product as I can. With a stainless steel system, I am limited to the volume of the tank I am using. So I would try to limit the size of it: The bigger the vessel, the more time and resources will be spent cleaning and sterilizing it. With a single-use system, I would have the ability to add more bags. Rather than stopping at 200 L because that is the size of my vessel, I could expand up to 250 L by adding a bag should the process require it. However, it’s important to note that single-use technologies still need control. For example, decisions regarding their materials of construction need to take into account the quality requirements of such systems. We cannot introduce just any material; we need data to support extractable and leachables studies, USP chapter <88> Class VI, and sterility. To that end, Parker has created its SciLog SELECT GO tool box of single-use components that enable end users to configure and receive single-use systems with standard lead times. By working from a predefined tool box, we know that the quality profile and design limits of the materials used are all correct. Therefore, we can design a system to customer requirements that can be quickly and easily integrated into a facility. This controlled flexibility drives single-use implementation, thus pushing up overall equipment effectiveness, increasing flexibility, and strengthening the supply chain of biopharmaceuticals that prevent, treat, and cure disease. Pence: Current annual manufacturing requirements (in kg) for many existing and in-development molecules — in particular, orphan drugs and biosimilars — are substantially lower than what were required for previous blockbuster biologics. When coupled with modern cell titers of 3 g/L or higher, this is a strong indication that smaller manufacturing footprints are capable of satisfying today’s molecule production demands. In consideration of that dynamic, 2,000-L single-use bioreactors become an optimal production vessel. They provide greater site flexibility through simplified cleaning procedures, allowing the same vessel to move from one molecule to the next with reduced turnaround time required between batches. Facilities are being designed for automation as well, with smart components that provide layers of process control and management. This enables biomanufacturers to evaluate and use a range of production processes — from batch and fed-batch to continuous bioprocessing applications — all while ensuring consistent product quality and processes. As the adoption of smart facilities and corresponding control strategies progress from individual unit operations to broader workflow processes, there will come an ability to automate scale-up and process-specific production strategies. Additionally, the digital connection of multiple unit operations (using a common platform) enables end-to-end communication and control. Those automated workflows will reduce human intervention greatly, mitigating another element of manufacturing risk. Simultaneously, they will deliver consistency and predictability across a biomanufacturing process to simplify reporting and documentation outputs for batch records, audit reviews, or regulatory filings. Combining process automation and single-use technologies gives us smarter facilities that offer a dynamic range of production potential and can be implemented rapidly at existing or new sites with a high degree of qualification success. BPI: Process analytical technology (PAT) can serve as a support for quality by design (QbD). How do they work together to promote facility flexibility and agility? Many biopharmaceutical process activities — from product development and materials supply to factory operations — are seeing improvement from an explosion in process monitoring, analytics, and computing capabilities. “Digital Biomanufacturing” involves developments in current and historical process data distribution and computing, machine self-learning, next-generation process control algorithms, and automation in sampling and control actions. Ultimately, we expect these technologies to provide greater process automation, continued and continuous process verification, performance-based control, and real-time batch release. Battist: Process and analytical technology transfer processes include integration of client control strategies into our disposable platform. A risk-based approach is used to evaluate client-generated critical process parameters (CPPs) and CQAs against the platforms at our Bayview site. That yields a consolidated control strategy for manufacture and testing in a disposable platform, which creates the foundation for process validation design and execution. Bylund: Marrying PAT and QbD is a significant undertaking that requires business commitments of both time and resources. To be successful, CPPs first must be defined and proven. A company must fully comprehend the quality control, reporting, and documentation requirements that are inherent to the design of its smarter facility. Additionally, management will need to address the primary challenge of connecting many islands of operation, with multiple interfaces and analytical tools. This is one of the first steps in building a smarter facility, and it requires infrastructure technology designed to allow integration through application program interfaces (APIs). Systems can be designed to recognize automatically the addition of hardware components, but decisions regarding how and where such data are managed still need to be made. A smart facility can effectively handle or even make elegant use of data, but many of its components will be electronically connected, with just as many ways to manage the resulting information. Today the challenge is in managing data that come with flexible facilities and corresponding equipment or process changes. The good news is that collecting data from day one can improve development to approval timelines. One example of preparing for future data processing is Thermo Fisher’s SmartFactory platform, which enables clients to collect data today for future use with automated, flexible PAT. BPI: Many large biopharmaceutical companies tout their environmental efforts. How can smaller companies benefit from efforts toward sustainability, and what are some basic steps they can take? What efforts does your company make toward improving its environmental impact — and/or helping its clients do so? Battist: As part of our mission to protect and enhance life, Emergent is committed to conducting business operations both safely and sustainably while working in our communities to improve the environment. Our sites each have recycling programs and currently are establishing environmental working groups that will monitor systematically and find ways to reduce energy use and systematically monitor environmental impact. Matthews: The general consensus is that SUT has a lower carbon footprint than stainless steel. But as new people enter the industry, the need to educate and explain to them should not be forgotten. Instinctively, throwing away massive amounts of plastics seems bad. But just because you cannot see the impact of stainless steel, that doesn’t mean it’s not there. If you measure the impact of making steel in the first instance, the energy required to run autoclaves, or a WFI still, then the disposal of wastewater and cleaning chemicals, the balance quickly tilts towards SUT. With energy-recovery programs (incineration to generate electrical power), and you can see that the overall environmental impact of SUT is further reduced. Whitford: True sustainability consists of a long-term, holistic approach that includes all environmental concerns, from material-determined mineral-resource depletion to process solid-waste disposal to facility retirement. As many as 18 types of environmental concerns in a product’s life cycle are evaluated in science-based approaches. These categories of environmental stress include concerns such as atmospheric carbon, water eutrophication and depletion, and land use. Remember that individuals, towns, and societies can have different ecological priorities. That is especially true when you compare considerations of immediate, short-term, and long-term environmental pressures with the relative costs of controlling pollution. Life-cycle assessment (LCA) is a technique used to assess environmental impact comprehensively — from the extraction of raw materials through product manufacture, use, repair, and end-of-life. These studies not only can identify opportunities to improve the environmental performance of a given product, but they also help companies establish objective, informed decision-making regarding them. Such studies have been performed on the overall environmental impact of single use and traditional bioprocess technologies to reveal many important truths about SUS in biomanufacturing. Understand the baseline. Measure the water, energy, and other resources currently consumed and wasted. How much of those come from renewable sources? How are your products shipped, used, and disposed of? Prioritize. Bring together a crossfunctional team to evaluate areas you can improve. Think about potential impacts and costs, degrees of difficulty, and required resources to help choose which projects to prioritize. Determine execution. Consider using internal resources and partnering with both suppliers and customers. Celebrate successes. By showing stakeholders the impact of successful sustainability initiatives, you can gain momentum and mind share to fuel future projects. Repeat. Choose another project to continue to grow the program and engage more employees, suppliers, and customers in your initiatives. Kakad: Companies can take a number of initiatives to become or remain environmentally friendly. Our organization has a solar-cell array that provides over half the power for the plant (1 MW of power per year). We also have a series of charging stations for electric cars, and several sustainability initiatives throughout the organization are led by a committee of dedicated associates. BPI: Some larger biotech companies provide academics and small start-ups with facility/laboratory space to work. Is anything similar happening in the supplier world? Battist: We partner with equipment and process technology providers to test and prove their offerings on our platforms. For our smaller clients, we also can offer assistance in determining an effective strategy for clinical supply and process development. We provide bids for Emergent to perform elements of required work cost-effectively or recommend subcontractors qualified for different services. But we do not rent out facility space. BPI: How can companies strike a balance between encouraging collaboration through open facility designs and allowing their employees the necessary room to focus and concentrate? How does your company work together with its clients toward these ends? Battist: To better understand the customer’s project and goals, significant work is invested before we even sign a contract. This extends after a contract is signed through dedicated project managers who track each project’s progress in weekly team meetings. Emergent’s Bayview site can receive direct process transfer from external development teams or further develop and scale up bench-scale processes from customers. Although we have a large number of standard biologic testing methods in-house, we also can develop new methods and arrange outsourcing through third-party labs. The goal is to provide service solutions that offer the best value for customers. BPI: We hear a lot about technology companies offering their workers elaborate facility “perks” such as on-site gyms. Are your companies going the similar extra mile for their staffs? How important is retention, and can this make a difference? Battist: We are always looking for creative ways to keep our employees engaged and attract new talent. Although the work itself is important, we pride ourselves in creating an environment that places significance on core values of respect, communication, empowerment, commitment, and innovation. Such is the work culture at Emergent. We offer the following to promote employee well-being: on-site yoga classes and massages; subsidies for gym memberships; availability of healthy snacks; options for flexible work schedules; and educational speakers on health topics. The most important aspect of retention is providing an environment in which employees not only can thrive and grow, but also feel that they are valued and their efforts are recognized. Teamwork and collaboration mean success, with each employee connecting to the overall mission. Kakad: Our organization offers many perks to promote a healthy lifestyle. We cover the cost of a gym membership and have many initiatives to foster healthy eating — from hosting recipe contests to offering free Nutribullets for associates and complimentary snacks throughout the facility. BPI: What choices can suppliers make for their new (and refurbished) facilities to benefit the local community — e.g., for hosting visitors, working with local schools, improving environmental impact? And what makes this worth the effort? Battist: Emergent has a robust corporate social responsibility (CSR) program that enables employees to request donations for local nonprofit organizations. Additionally, each employee gets eight hours of paid time off to volunteer in the community. Our eGIVE (Give, Invest, and Volunteer in Emergent communities) program focuses on five key areas: advancing global health, protecting the people who protect us, educating tomorrow’s scientific leaders, helping our communities, and sustaining our environment. Kakad: Our organization deeply believes in giving back to the local community. In addition to organizing a number of charitable drives throughout the year, we also offer local high schools the opportunity to tour our facility and learn what a career in the biotech industry can offer. As biopharmaceutical manufacturers face growing demand for adaptable processes and multiproduct production environments, a critical need arises for facilities that seamlessly and quickly adapt to changes in markets, technologies, society, and manufacturing processes. New “smart” facilities will be designed not only to handle changing product volumes, but also to be ready for integration of disposables and other technological advancements. In the near future, biomanufacturers will look to developing such efficient and smart facilities to help bring their products to market faster — and suppliers of equipment and services are ready and willing to help. Heather Beaudoin and Shannon Meirzon are cofounders of Pyxis Communications, Granite Ridge Road, Atkinson, NH 03811; 1-203-550-5978; www.pyxiscommunications.com.